An evergreen rounded tree from The Mediterranean (and perhaps SW Ireland). 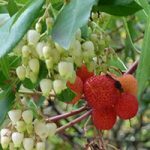 Often grown ornamentally for its flowers – loved by bees – in autumn, but it also bears edible fruits at the same time (from the previous years flowers). Wait until the fruits are completely ripe then they have a lovely delicate flavour.